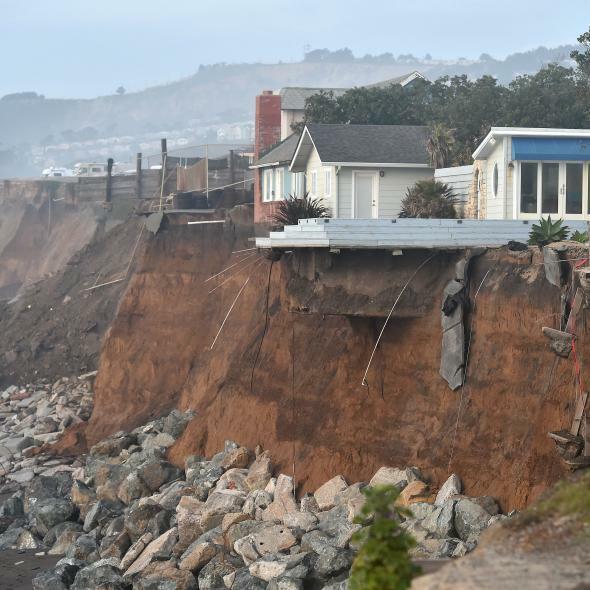 Sections of land are seen missing from coastal properties in Pacifica, California after El Niño-related storms on January 26, 2016. As far as El Niños go, the one we’re experiencing now is a doozy. In fact, it’s probably the strongest that’s ever been measured. In the simplest terms, that means one thing: Get ready for another year of wild weather. In California, that wildness is on full display this week. On Monday, a line of thunderstorms rattled through the Los Angeles metro region during the morning commute, bearing lightning, hail, and wind gusts near hurricane force. Over the weekend, nearly a foot of rain fell in parts of the San Francisco Bay Area, and heavy snows near Lake Tahoe and on Mammoth Mountain measured nearly 60 inches. The extreme weather was part of a series of sprawling storm systems lined up to impact the West Coast—a classic feature of strong El Niño winters. Over the past month or two, the ocean temperature in the tropical Pacific has started to decline, but that doesn’t mean El Niño’s effects are waning. In fact, due to an atmospheric lag, extreme weather will likely keep getting worse for several more months. Though El Niño is typically the most powerful player among the world’s constantly feuding meteorological morphologies, it takes months for its burst of heat to filter around the globe from the tropical Pacific. Ocean temperatures in the El Niño regions of the Pacific usually peak in November or December, but globally-averaged temperatures don’t typically peak until between February and July of the following year. In other words, it might be awhile before global weather starts to return to a more normal state. That lag means weather patterns will remain skewed throughout much of 2016. It’s also how we know that, even though 2016 is still just getting started, it’s already a shoo-in for the warmest year we’ve ever experienced as a civilization—beating 2015, which beat 2014, which beat 2010, which beat 2005, which beat 1998, which beat … you get the idea. Though El Niño is the proximate cause of many of this year’s weather records, its effects are an upward wiggle on top of the slow-rolling steamroller of climate change. Unofficial data from February show that it likely beat January’s record for the most unusually warm month ever measured, and initial data from the first few days of March are even more alarming. Expect global temperatures records to continue being shattered for several more months. In the meantime, the consequences of this year’s El Niño are already devastating, and growing worse. Nearly 100 million people worldwide are facing food and water shortages this year due to drought and floods linked to El Niño. Peru has dispatched its army to help flood-ravaged areas recover. In Argentina, persistent flooding has washed a flotilla of poisonous snakes downstream, closing beaches. Across southern Africa, current conditions are the driest in a generation. In Ethiopia, crop yields have fallen by half in just a year’s time—spawning the nation’s worst food crisis in decades. Harsh droughts have also hit Central America, Southeast Asia, some Pacific islands, and Australia. In the Philippines, the fish catch is expected to fall by 20 percent. El Niño is also helping to spread vector-borne diseases, like Zika, malaria, and dengue fever. And all the crazy weather is creating an uncertain economic environment, too. Closer to home, there have already been a few Florida tornado outbreaks this winter—Miami’s rainiest on record—and the state can expect more. Further north, New York City has had one of its warmest and snowiest winters on record—an odd combination to say the least, but exactly what was predicted. Out west, a wildflower “super bloom” is stunning visitors in Death Valley, the hottest place on Earth. This year’s exceptional warmth and weirdness will also have a lasting impact on the climate, especially in the Arctic. Sea ice there is at record low levels for this time of year, and this winter’s temperatures may be helping transition the world’s tundra from a storage region of greenhouse gases to an emitting region. This is what weather chaos looks like. Thankfully, climate scientists are using this rare event to learn as much as they can about what the super El Niño might tell them about future events and climate change—like in coral reefs, which are especially threatened this year. Though it’s still too early to say for sure, longer-range models are beginning to come into agreement that this El Niño will transition to a La Niña—featuring an unusually cool patch of tropical Pacific waters—by late this year. That means a temporary breather when it comes to global temperatures, but a La Niña would introduce a whole new set of weather extremes, from an above average Atlantic hurricane season to flooding in Southeast Asia to renewed drought risk in California.